Ortofon Concorde Gold Twin Cartridges DJParts - All Variety of Parts that DJ Needs. 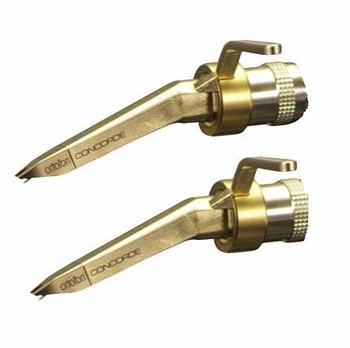 Ortofon Concorde Gold has been manufactured to enhance the Technics 1200 gold limited addition and is based on the Concorde Nightclub E. The Concorde was chosen because its streamlined body will reduce the amount of airborne feedback, as there is no bulk of the head shell to pick up the sound pressure waves. The diamond is accurately cut to professional specifications highly polished ensuring lower surface noise and an absolute minimum of record wear ensuring improved sound quality.